Midphase started its business in 2003 and they worked hard to make their web hosting reach perfection. They have built their reputation because of their skillful and hard working people who knows what their customers want and need. Midphase web hosting company knows that there are different needs from people with their own personal blog and those who want to build a large website for business purposes. They are well known for offering cheap hosting packages that others can’t beat. That’s because they are able to cut back on the operating costs thus they can lower their prices without depreciating the quality of service. Other web hosting companies try to beat the price but they find it hard to do so without making sacrificing with their services offered. Smart web designers know that Midphase web hosting is the best in terms of price, efficiency, reliability and customer experience. All plans include unlimited disk space and bandwidth. Their cheapest plan, even if you decide to go with a monthly payment plan, is $5.95 or cheaper. Midphase requires an upgrade to a much pricier option if need eCommerce, a static IP, or advanced web analytics. If you don;t choose the business plan, these options cost extra. Midphase web hosting is offering three shared hosting plans to choose from, the Personal Web Hosting, Professional Hosting, and the BUsiness Web Hosting plan. Midphase Personal Web Hosting – this type of hosting is best for all kinds of websites. It starts for as low as $1.77 a month for a 3-year subscription. You are going to get 1 domain name for free, a 1 click installation and 24/7 customer support. If not satisfied, you can get your money back as they have a 30 day money back guarantee. For the personal web hosting you are getting unlimited web space and bandwidth. They are using the user friendly control panel cPanel. Their hosting is also ad-free. You will get unlimited email accounts with enterprise-class webmail, spam assassin and more. For e-commerce they support merchant accounts, self-signed ssl, PayPal support, CubeCart, ZenCart and Agora Cart. Midphase Professional Hosting – This plan offers you the ability to host 3 websites instead of just the one with the previous hosting plan. You can also host 3 databases, 5 subdomains and the ability to add a dedicated IP address and SSL if needed. 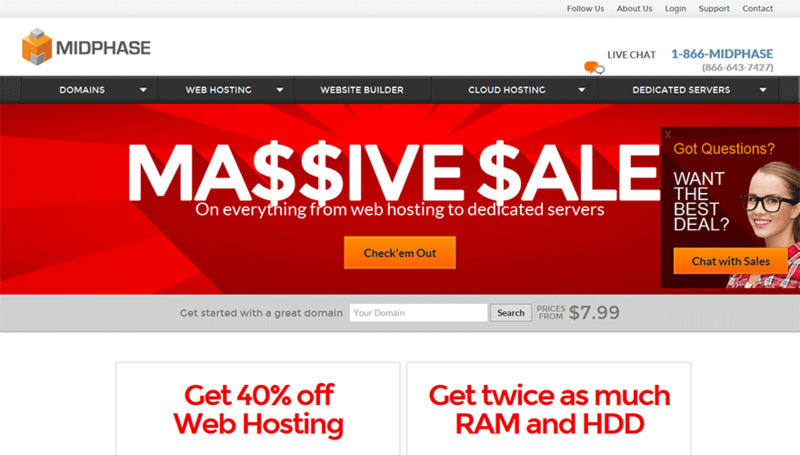 Midphase Business Web Hosting – This type of hosting is what you’d need for selling online. It’s yours for as low as $4.77 a month for a 3-year subscription. It gives you all that the personal hosting gives plus you’d get a free static IP address and SSL certificate. You can host as many websites as you want and it offers unlimited MySQL databases and sub-domains and so much more. It’s all you’d ever need for any business website or high traffic sites, blogs or forums. 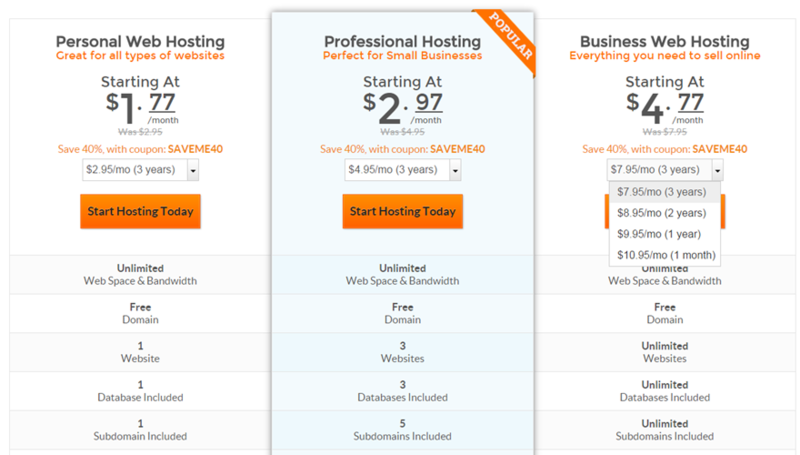 This is the cheapest web hosting you’d ever find with all the great features that they offer. You won’t need to add anything as it’s all packed in one great and cheap web hosting package. They offer 24/7 customer support. This is very important as problems with your sites can arise any time of the day or night and you may want to get assistance to help you out as soon as possible. Midphase Support Center gives you a knowledgebase that you can search through for answers. Most questions that are often raised are already answered here. If that’s not yet enough you can easily get in touch with their customer support team. You can give them a call, send them an email or chat with them. They made it very easy and convenient for you to get in touch with them and find the assistance you need at the quickest time. Midphase is known for being a cheap web hosting company because of the price of their web hosting plans. They may be cheap in terms of price but they are not at all cheap in terms of services. Many competitors are trying to beat them but they just can’t. It’s one of the biggest advantages of Midphase web hosting and it’s something that many customers are happy about. Once you discover this company and give their web hosting a try, you would most likely stick with them for many years. Midphase operates on Unix/Linux operating system and they use cPanel control panel. They have a 1-click installation that makes it very easy for anyone to install and build websites. You don’t need to be an expert as they make it too easy that you can easily create the websites you only dream of. Scripts are already provided so you can just choose what script you want to add to your web pages. They even have a free offer of moving your site when you do make the switch.